The Omega Max fence system is the premiere anti-climb, vandal resistant and anti-cut containment solution. It is ideal for high security facilities, light rail transit, or any other location that requires the maximum level of safety and security. The design of this Security Fencing system utilizes openings that are 1/2″ x 3″ and post-integrated fastening hardware. Available in four foot, six foot and eight foot (+ stackable) heights, the entire system is pre-galvanised and powder coated for maximum durability. Omega Max comes in over 1,000 standard, optional and custom colors. Most RAL colours are available. Specify light colors, such as white or yellow so that your fence is visible from a distance, or select darker colors, such as brown or green so that your fence blends in with its environment. Custom and standard gates are available. Omega II Fence Systems has options for varying levels of security. 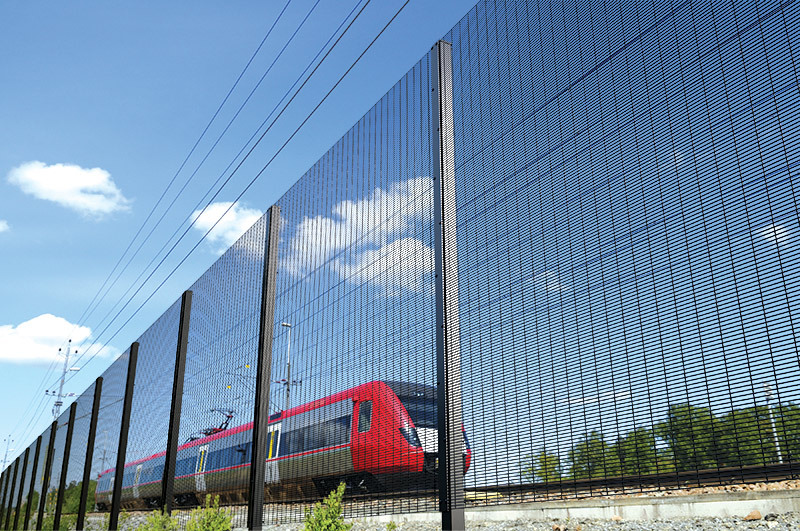 Security Fencing is available for rooftops, zoos, militatary bases, prisons, transit systems, pool enclosures and more. Contact Park Street to discuss which fence system is the best solution for your unique project needs.